I remember the first time I encountered a snickerdoodle. It was devastating. I was in 2nd grade at the time, and we were at a Christmas dinner, and the hosts were talking at length about a batch of snickerdoodles, and how the recipe came from one of their grandmothers. I was convinced that snickerdoodles were made from, what else, Snickers bars. I didn’t know what exactly these snickerdoodles would look like- cake, cookie, pie- but I just knew they had to have Snickers in them. And then when the coffee was served I saw brown sugary cookies and I almost cried. How could snickerdoodles NOT have Snickers in them? I felt cheated, like when I got an oatmeal raisin cookie instead of chocolate chip. But that was then. I was 7 and didn’t know my way around the world of baking, and I assumed if it said snicker in the name, it had to have Snickers in the body. But snickerdoodles are a wonderful, wonderful cookie. Pleasant, chewy and with a hint of spice. I like rolling the little balls of dough in the cinnamon sugar as much as I like eating them. 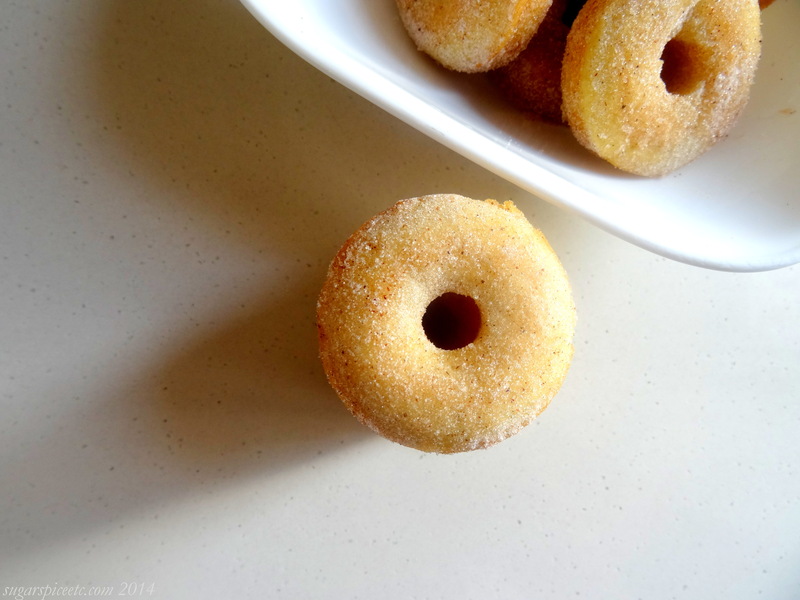 I wanted to create a breakfast treat that was snickerdoodle-y, so I decided on a simple baked donut. My niece loves donuts, so I created these with her in mind. These are mini-donuts, but you can pipe the batter into a regular donut pan to make standard-sized donuts. The batter comes together quickly, like a muffin batter- dry and wet ingredients are whisked separately, then stirred together. No heavy-duty creaming or beating. And who can go wrong with a coating of melted butter and sprinkling of cinnamon sugar? If you have a Cinnabon craving and don’t have the patience to work with a yeasted dough, these little guys should do the trick. Just a note: I halved this recipe and got 18 mini-donuts. Preheat the oven to 165°. Grease a donuts tray and keep aside. In a large bowl, gently whisk together the flour, sugar, baking powder and salt. In a separate bowl, gently whisk all the wet ingredients: milk, eggs, butter and oil, along with the vanilla. Stir the dry ingredients into the wet ingredients, mixing just until combined. Bake the donuts for about 12 minutes, (checking after 10 mins) or until a toothpick inserted comes out clean. While the donuts cool, make the cinnamon-sugar topping by combining the cinnamon and sugar in a large bowl or plate with the fork. Once donuts have cooled down a bit, dip a pastry brush in the melted butter and brush the top and bottom of the donuts with butter. Dip/roll the donuts in the cinnamon sugar mix. Hey Jo!! How go things in your part of the world? I love browsing you biccie posts 🙂 Yeah, snickerdoodles do sound like they should have Snickers in them, right? But yes, cinnamon is great in almost any baked goodie! 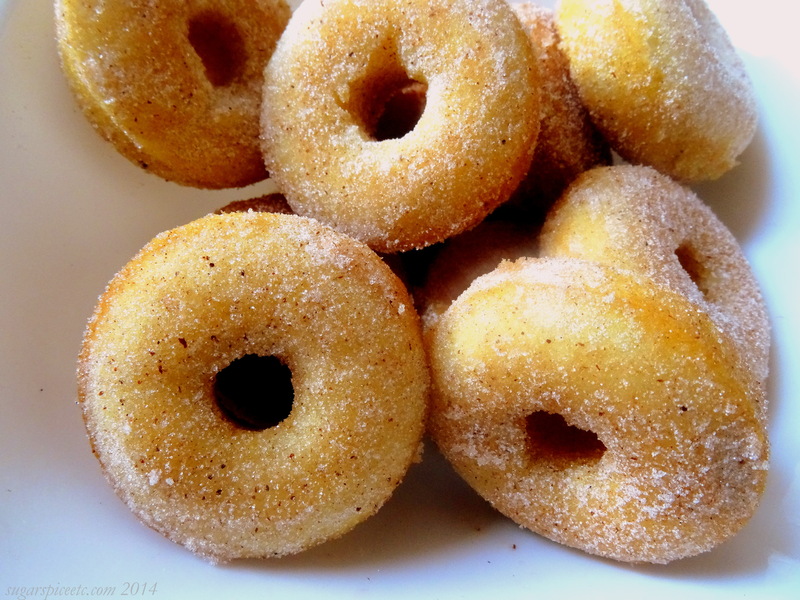 Oooh…… sounds sinfully delicious….. the cinnamon sugar does that to you every single time ! !.